Nifty knitters are needed to get involved in a woolly mammoth of a task – to help create colourful artworks that can be displayed at our six community hospitals throughout Oxfordshire this summer. 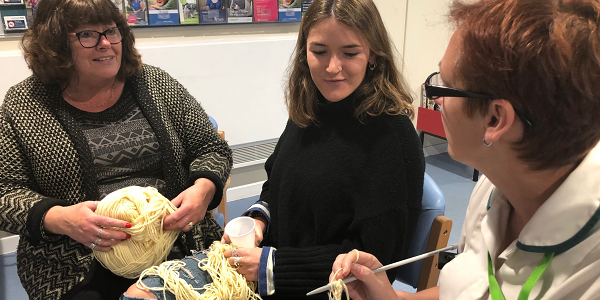 In preparation for next month’s Dementia Awareness Week Oxford Health staff and patients are working with our Creating With Care programme to launch a knitathon project that will see our community hospitals ‘yarn bombed’. We want purly kings and queens to cast-on and donate colourful pom-poms, squares and crafty creations to the cause. It is estimated that more than 8,000 people in Oxfordshire live with dementia and they are supported by an army of carers. Worldwide there are almost 50 million people living with the condition and Dementia Awareness Week seeks to make more people aware of the disease and its symptoms to encourage early diagnosis. While the trust has previously joined forces with the Witney Dementia Action Alliance to ‘turn Witney Community Hospital blue’ with balloons as a part of the annual awareness week, this year we’re getting everyone involved with a county-wide knitathon a fun alternative that is already engaging patients, staff and community members. Angela Conlan, arts co-ordinator at the trust and Creating With Care (CWC) programme lead, said: “Knitting is very mindful and can help someone with dementia live well. For people with restless hands knitting can provide something to do with a sense of achievement and can help lower stress. Patients and staff have already started work on the project as a part of the CWC programme, which uses creative arts projects to enhance people’s experience in hospital. The programme is expanding to cover community hospitals in Didcot, Abingdon, Wallingford, Oxford city and Bicester thanks to funding from Oxford Health Charity, following two years’ success at Witney Community Hospital. With enough woolly donations, the CWC team will set about ‘yarn bombing’ as many of Oxfordshire’s community hospitals with each site getting its own unique piece of artwork. Community members are encouraged to join with patients and staff in this wacky woolly project regardless of talent; whether you have basic skills or are very accomplished you could produce a piece to be included. Work on your pompom, strip or square whenever you have a moment: waiting for an appointment, visiting a friend, or relaxing at home or in your hospital bed. Don’t be afraid to get creative – all shapes and sizes of woolly creations are welcomed with no restrictions! You can help even if you don’t have the time to craft; we’re are also looking for donations of knitting and crochet needles and brightly coloured wool. Leave your donations and finished pieces at reception at any community hospital in Oxfordshire or ask for wool and needles to ‘knit and wait’ in the waiting area. Don’t forget to give your work back before you leave. Dementia Awareness Week runs May 20 to 26. Submissions will be accepted until 16 May with the project set to go live on May 20, though you can stop by to see the result of the project at Didcot, Abingdon, Wallingford, Oxford City, Bicester and Witney Community Hospitals throughout the summer.